The Live Target Hollow Body Frog is a New Product Showcase Winner at ICAST 2010! 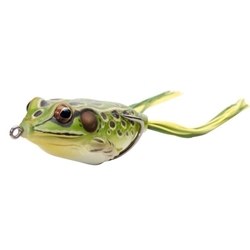 This Hollow Body Frog comes in three different sizes and many colors that are sure to convince even the smartest of fish bite. The smallest of the sizes are a 1-3/4" Floating 1/4oz. The middle is a 2-1/4" Floating 5/8oz and the largest of the three is a 2-5/8" Floating 3/4oz frog. Quantity Size 2-5/8oz" 2-1/4" 1-3/4"